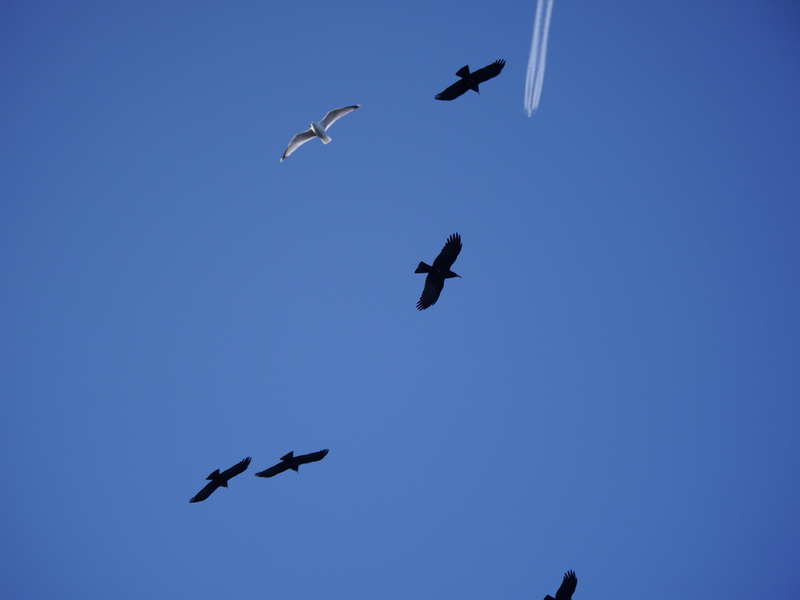 February, normally a relatively quiet time in the chough calendar, quickly became action packed. It started with the first snow of the season, the first ever for the chicks. 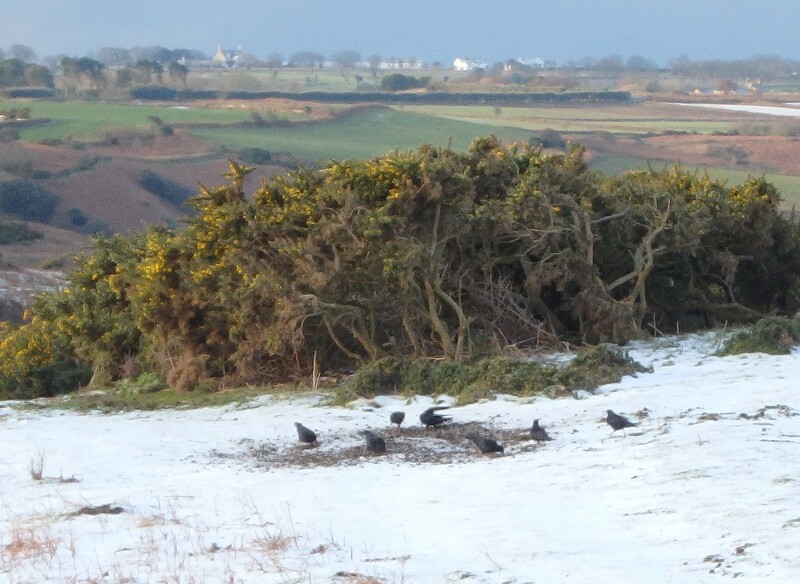 The choughs searched out snow-free ground to probe in this month (they obviously didn’t look behind the gorse!). Photo by Harriet Clark. 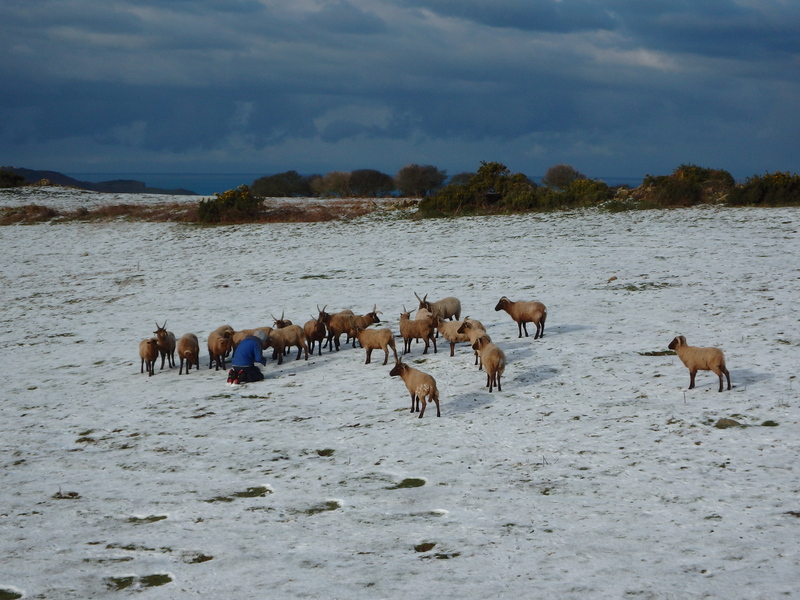 It quickly became apparent that the field staff were more excited by this than the birds. All the choughs cared about was finding food. 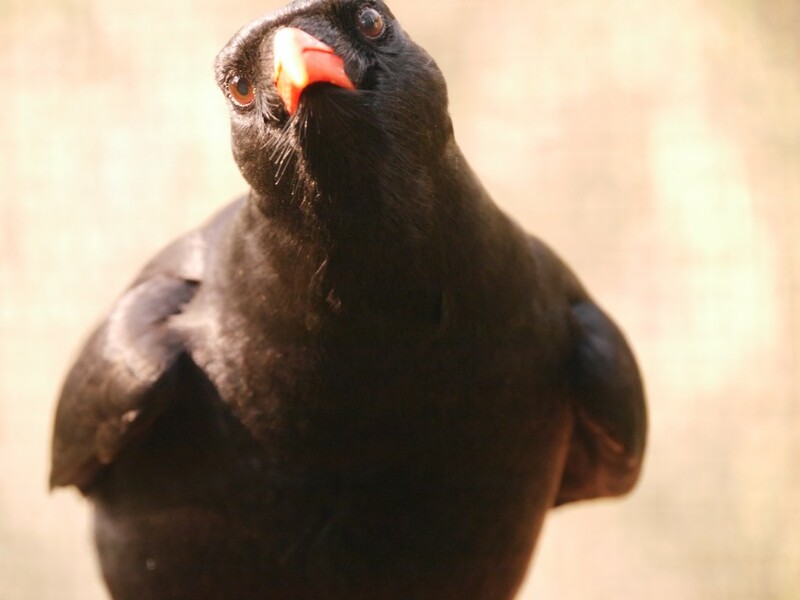 In the wild, choughs don’t tend to fare too well if the ground freezes because the surface is too hard to probe. 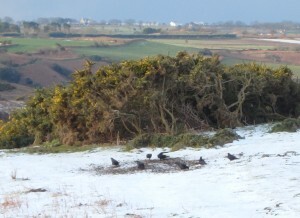 There wasn’t much snow in Jersey, but enough for the choughs to start looking for exposed ground. Even if the birds can dig below the surface, ground temperatures are not particularly favourable to the insect communities. This was evident when the pitfall traps were collected in by the students. Most were empty to the dismay of the sheep who obviously thought they might be full of food. 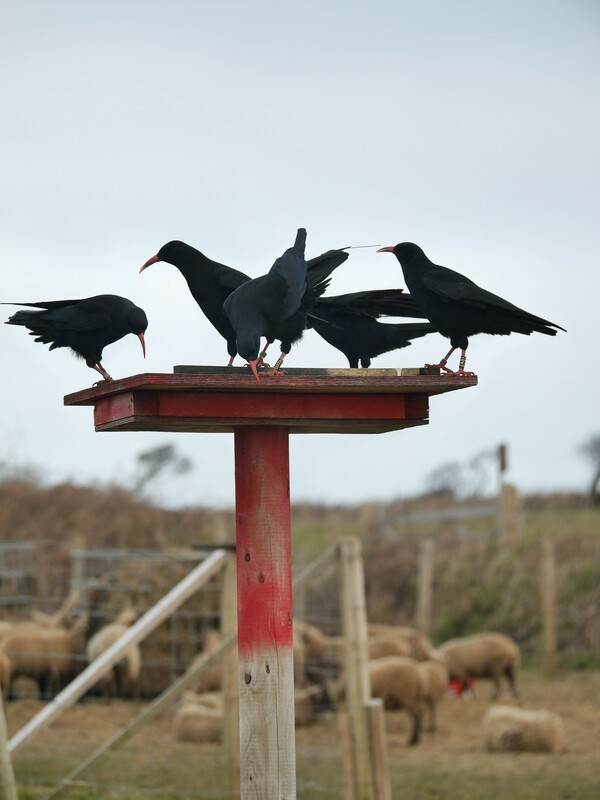 Naturally the choughs became more dependent on the supplementary food we have been giving them. The fact that no individuals have died over winter due to starvation is in part a testament to how post-release care is important for a successful re-introduction. Chickay getting stuck in to her aviary feed. Photo by Liz Corry. 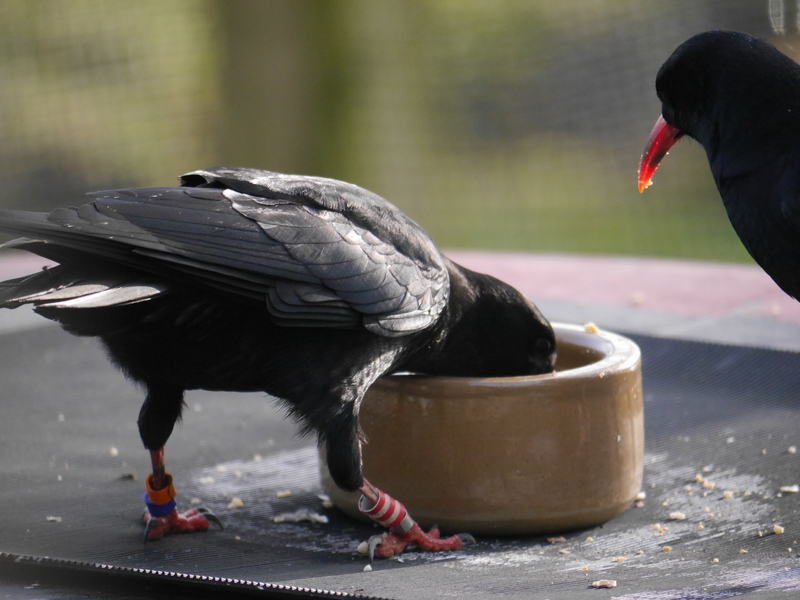 Knowing that we want to release more choughs this year and the next, we have started to prepare ourselves, and the choughs, for what happens if there is too much competition in the aviary at feed time or if the original cohort disperse further afield. Food stands in the aviary field reduce competition for food in the aviary. Photo by Liz Corry. We continue to use the external food stands in the field to create multiple feeding sites, thus reducing competition. Especially from the bold, hand-reared chicks who zoom to the bowls first. Whilst we might have the odd magpie attempt to masquerade as a choughs to get free food we have not had any problems with other species taking food. Song thrushes arrived back at Sorel this month and spent most of the time in the aviary field filling up on insects. Photo by Liz Corry. 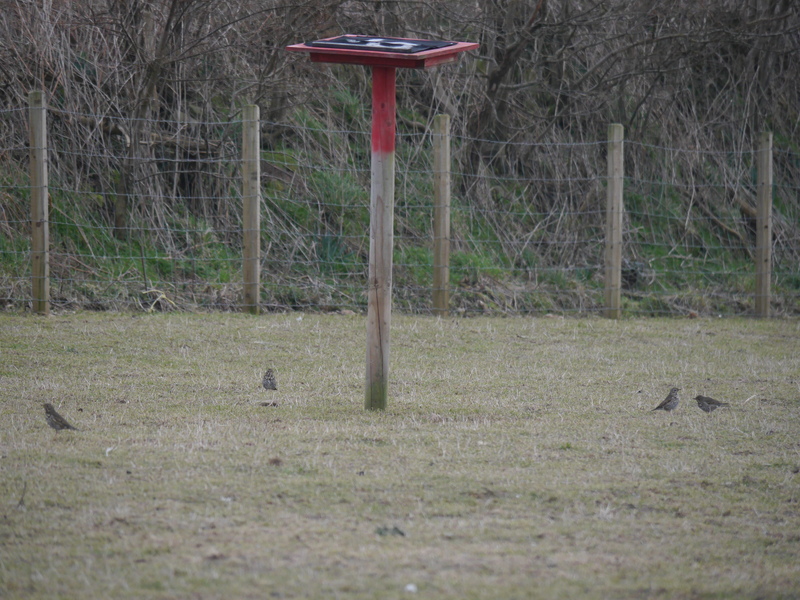 The dozen or so song thrushes who visited the aviary field this month did take a shine to the food stands. I’m guessing their interest was in any spillage underneath. Or maybe the sheep ‘fertilizer’ has created an insect hotspot which meant they favoured that field over others! We have started taking portable target boards out onto the grazed headland to get the choughs used to feeding elsewhere. 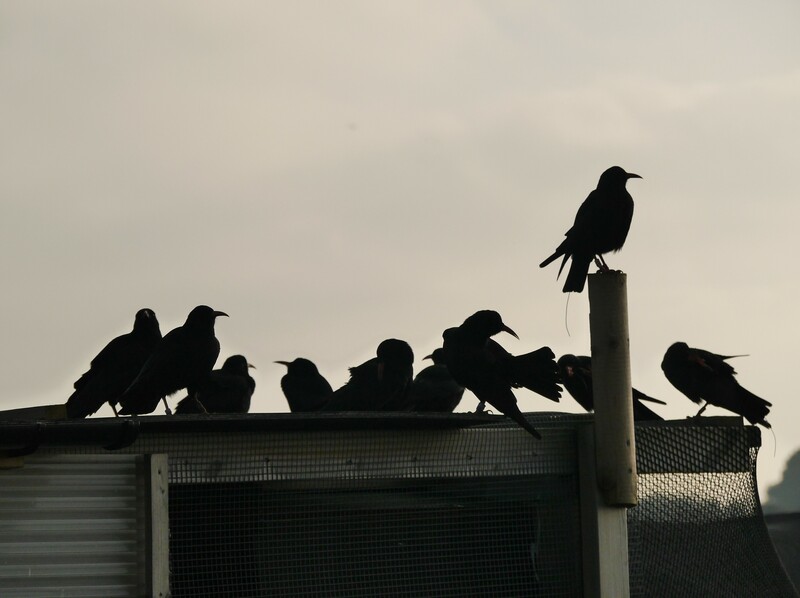 We might get individuals or pairs dispersing far away from the aviary and we want to guarantee we can get the supplemental food to them if they don’t return to the aviary. Initially we treated it as a test. Have they just become accustomed to being fed in the same places each day or would they recognise a target board at a completely different location? 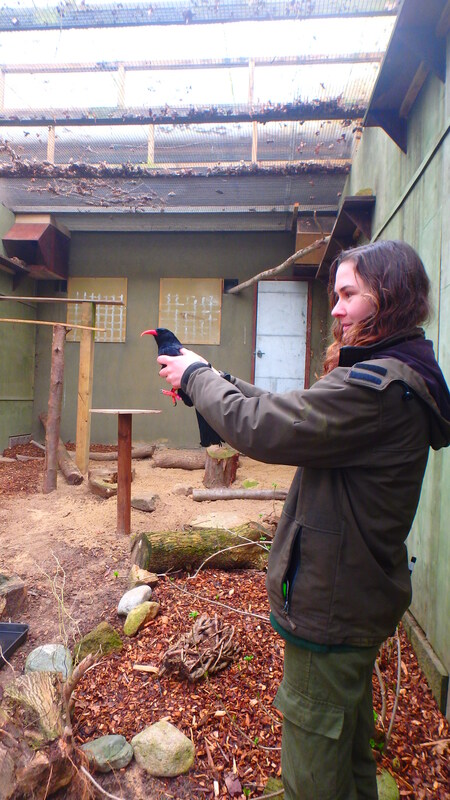 Their corvid intelligence shone through and they eagerly flew to the targets wherever we put them. So far we have only tried relatively close to the aviary. As their success in finding the targets continues we will try further afield. 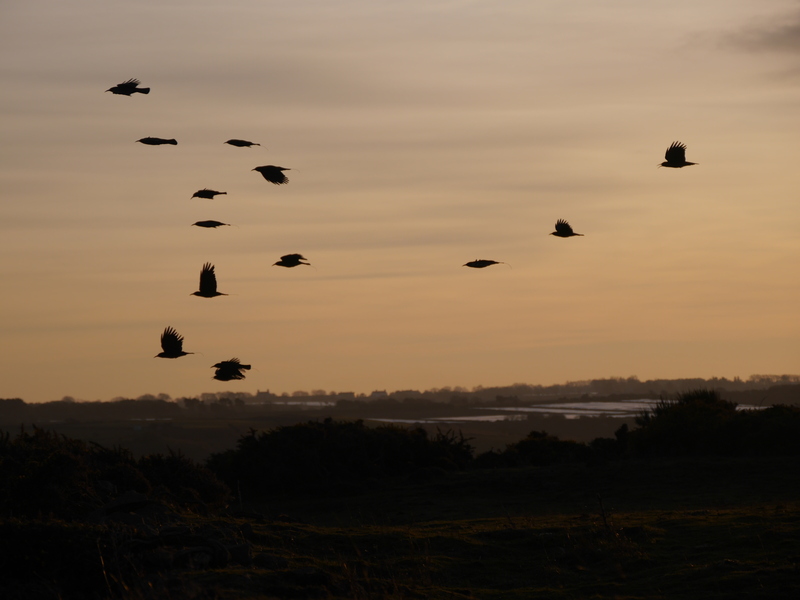 In the wild, the chough breeding season kicks off at the end of February or early March if the weather is mild. Breeding pairs are gathering materials and building their nests to rear their brood over the following three months if successful. 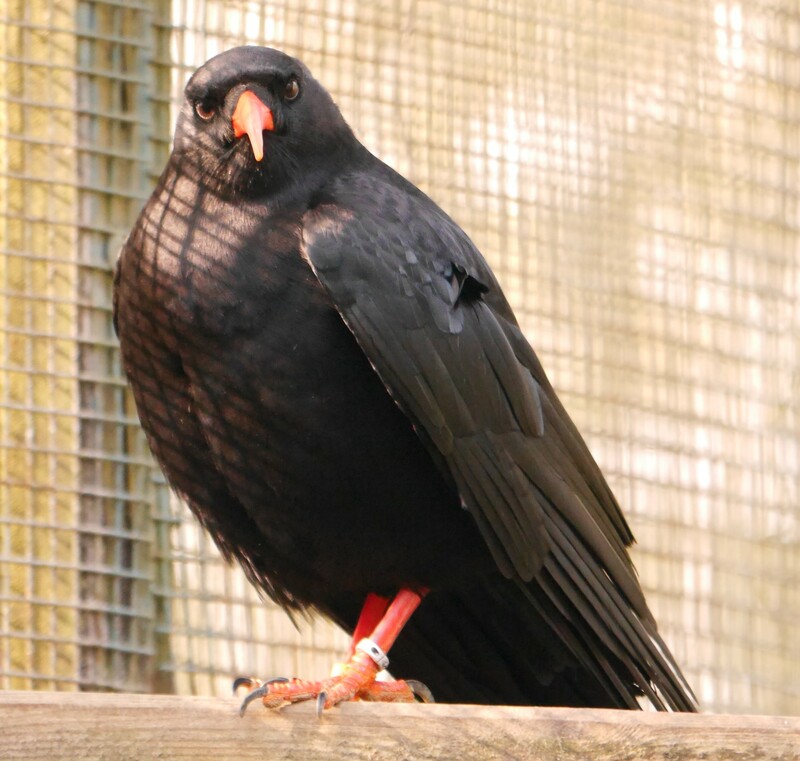 Some of our original choughs released in 2013 are now sexually mature and we have two pairings with potential to breed. Over the next few months we will be following Green and his partner Blue very carefully along with White and his partner Mauve. To aid in this, as mentioned in January’s report, we have added a radio transmitter to Green, the oldest male in the group. By doing this we were quite surprised to find out that he has been roosting in the quarry buildings. From our observations the previous few months we have always seen White and Mauve fly to the quarry at night and Green and Blue hang around the aviary. Some of the structures in the quarry that the choughs like to hang out on at weekends. Photo by Liz Corry. It might be that this move to the quarry is recent. Although what we fear is that the pair have tricked us and quietly sneaked out seconds before everyone else has gone to roost. Visibility at dusk is poor as you can imagine and we watch from a distance to avoid disturbing them. The only guarantee is if we can hear their transmitters beeping away in our headphones. 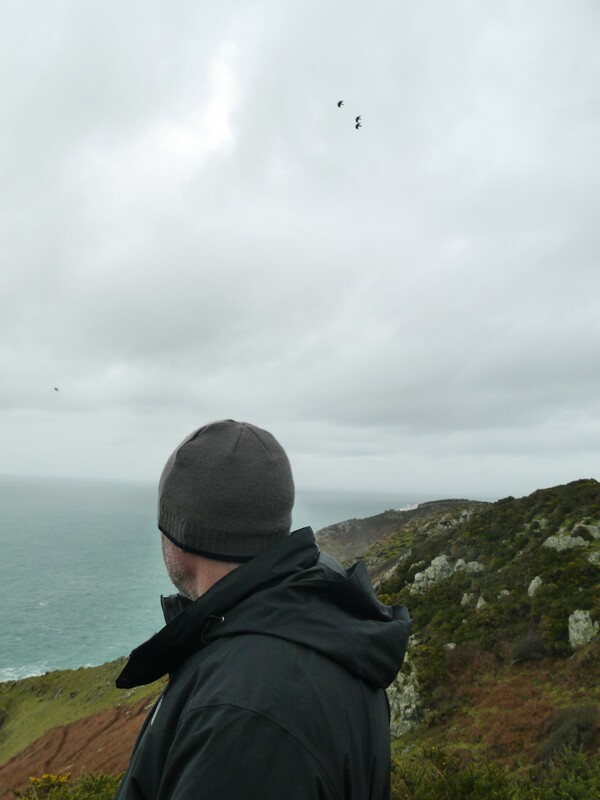 It also helps having ‘spies’, otherwise known as quarry workers, who keep you informed on how many choughs are waiting for them when they start work at 6am. We were told that four had roosted in the quarry the day we started radio-tracking Green. Presumably the fourth bird is Green’s partner. If not, I think someone needs to break the news to Blue! 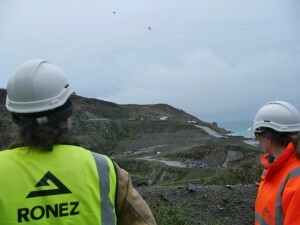 Ronez Quarry have been a huge support throughout this project and this month was no exception. 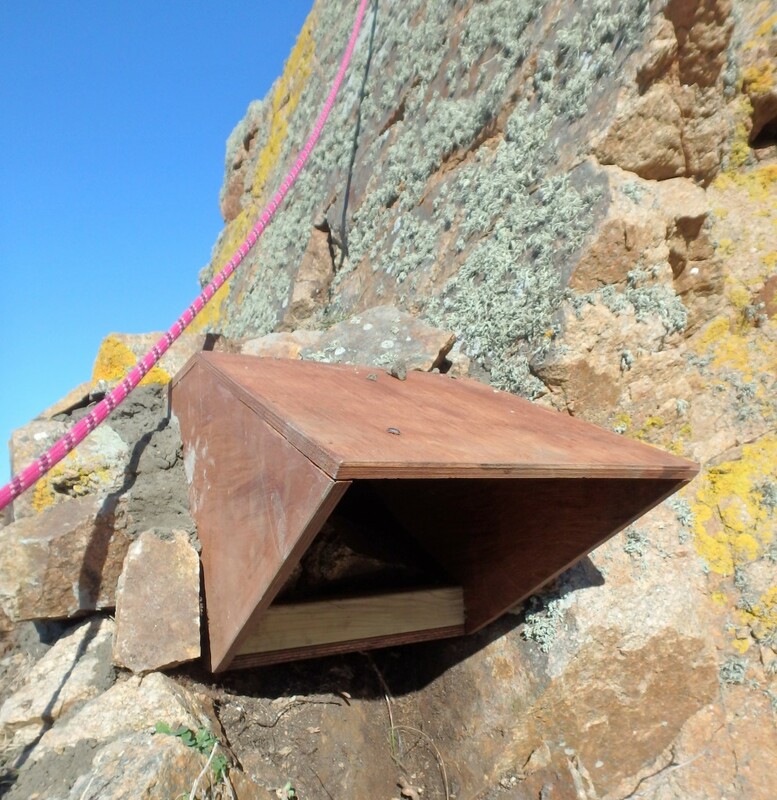 They provided funding to build nest-boxes for our inexperienced choughs who might want to nest along the north coast but could be looking for boxes, just like the ones they were reared in, rather than natural crevices. This could be the case for the first year of breeding. Then, as they build in confidence and experience, they will happily use natural sites. Since we have birds roosting in the quarry already we suspect that they might try to nest on the rock face or in the buildings. If the latter we need to provide them with somewhere safe and sheltered from the dusty working environment. We spent a couple of days surveying the quarry for potential nest sites with manager Kirsten DuHeaume, and foreman Kevin Gray. 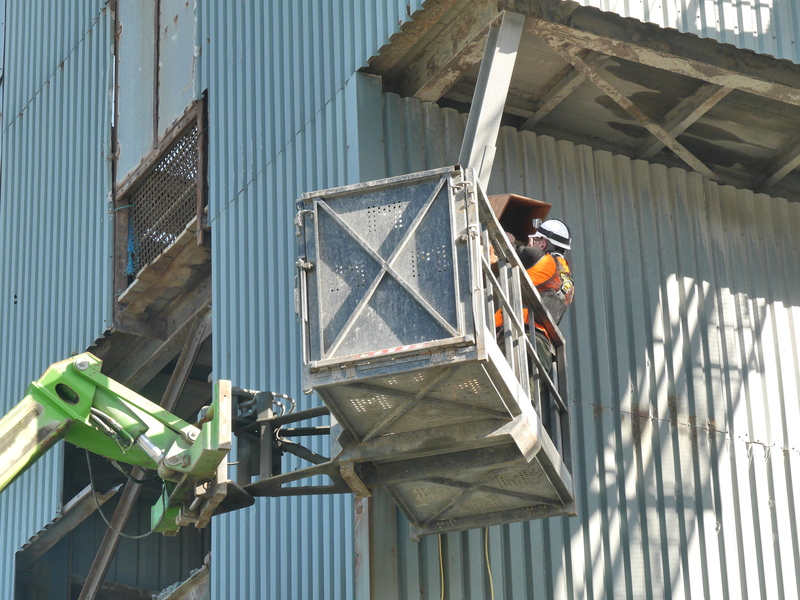 We also had to consider which sites were feasible from a health and safety perspective. 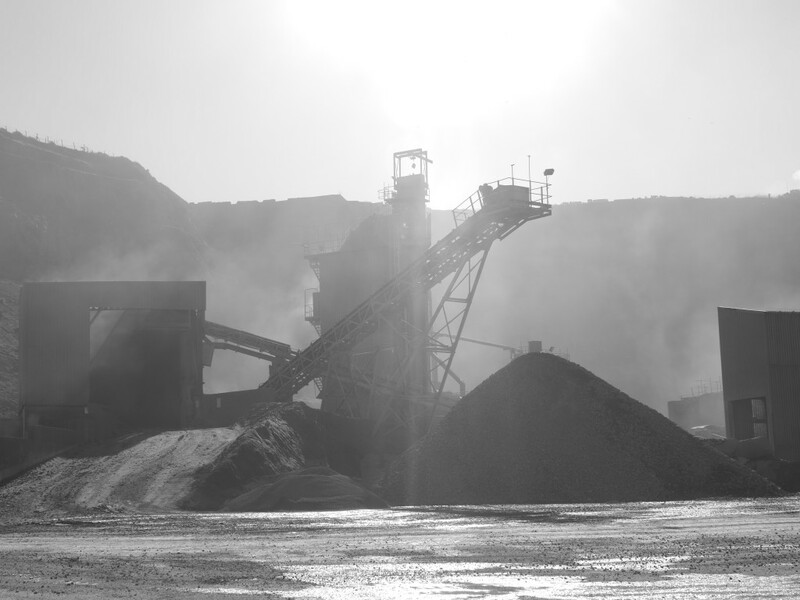 Blasting rock for quarrying purposes can leave hidden fractures in surrounding rock faces. What might seem stable from the outside is actually far less when it comes to working on it. Some buildings which looked suitable could not be reached to place the box high enough for a chough to consider using it. We managed, however, to find a few suitable sites and the rest of our boxes were distributed along the north coast. Ronez kindly provided the use of their machinery as well as their staff to operate it. Not only that, but they paid for Tony Cross to come over from Wales to advise and assist with fitting the boxes. Within seconds and with precision and skill, Kevin Le Herrissier designed a couple of steel supports to aid in fixing the boxes in place. Tony assisted in positioning the boxes and adding handfuls of gravel, the equivalent of ‘soft-furnishings’. 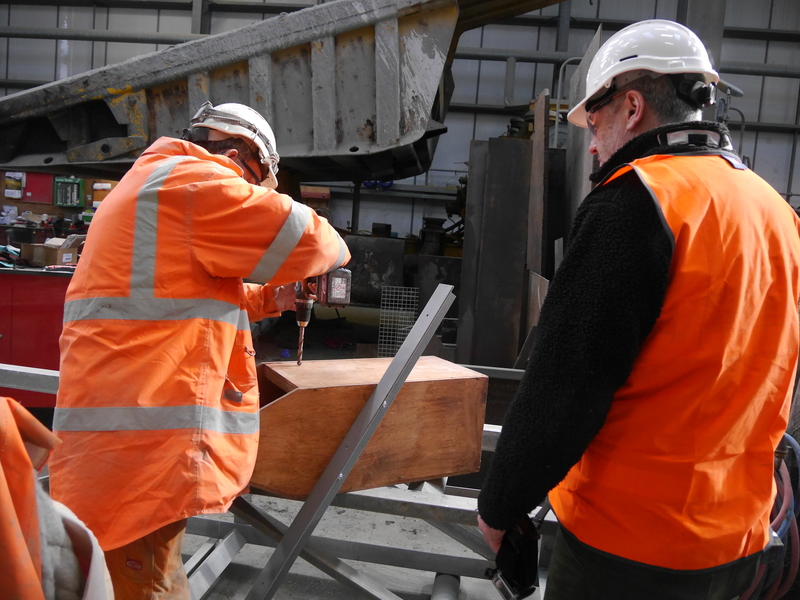 The boxes, designed by Tony Cross, were built off-site by two volunteers, John and Mo, who work in Durrell’s Maintenance Department and, thanks to Steve Luce, by La Moye Prison. 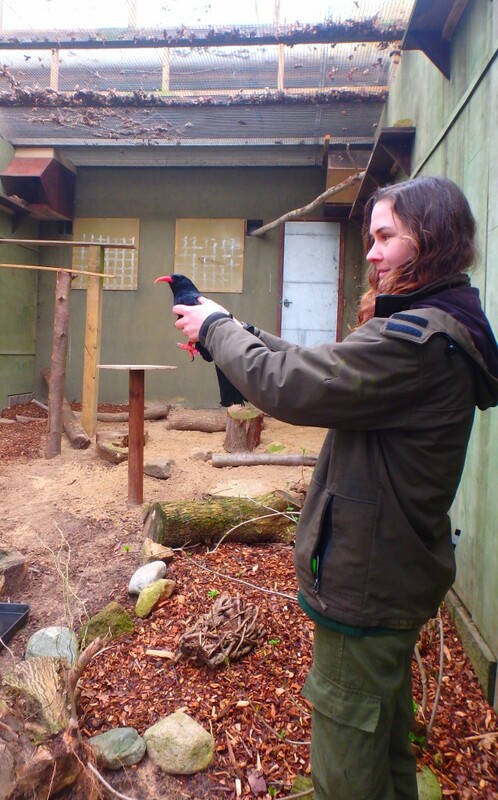 The prison have previously built nest-boxes for other projects but this time it feels more poignant since La Moye was the last recorded breeding site for wild choughs in Jersey. 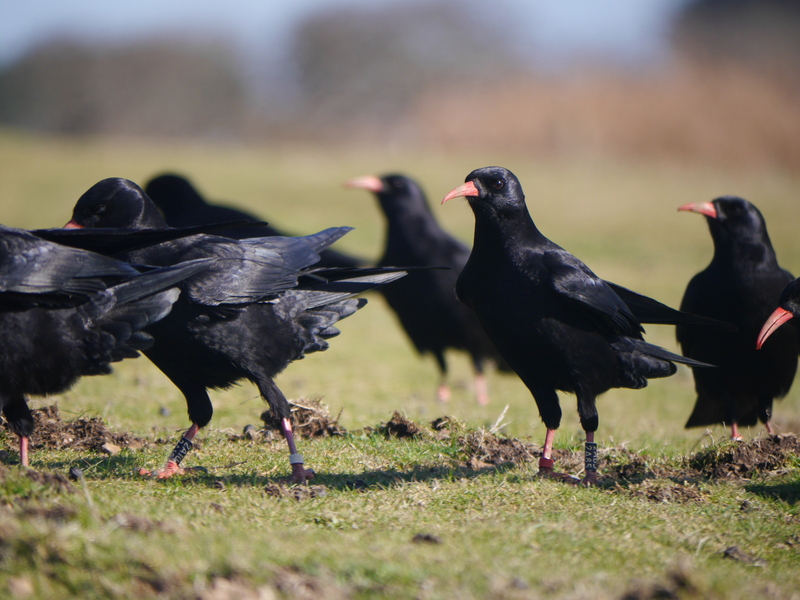 Due to the sensitivity of the choughs and to safeguard their survival we will not be disclosing to the public the exact locations of the nest-boxes or any natural sites they use. Licences are required in the UK, just to take photos at chough nests as a certain level of legal protection is needed to deter egg-poaching. Of course the choughs are free to choose where they go and sometimes, as with the quarry, it can become quite obvious. For now, here are a few photos to give you an idea of what we got up to. Needless to say don’t try this at home unless you are equipped with a fully operational Tony Cross. 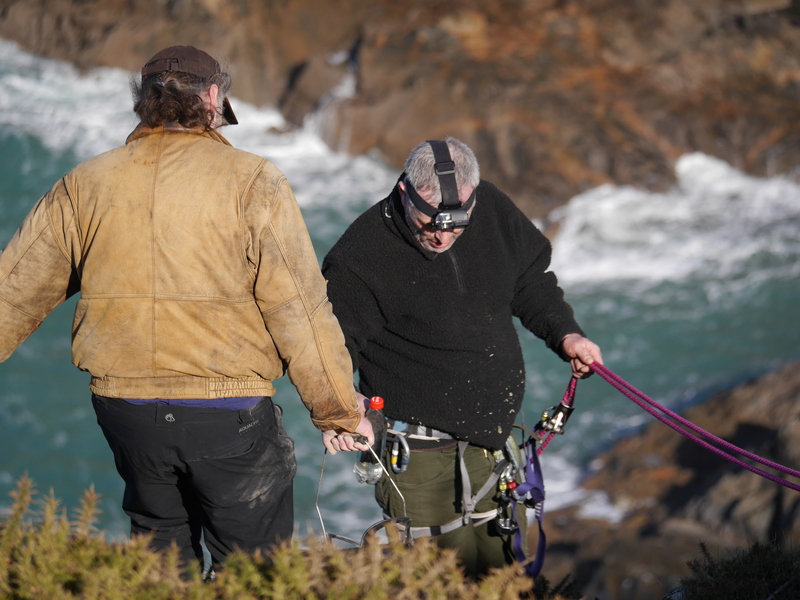 We also had help from our project partners in the form of National Trust ranger, Neil Harvey, and the States of Jersey’s principal ecologist John Pinel, an experienced climber. 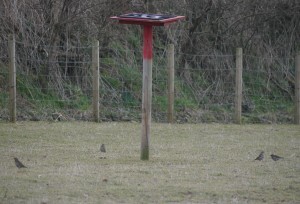 I must also add that we have permission from the landowners to erect these nest-boxes. A requirement for anyone wanting to put up a nest-box. Tony and his colleague Adrienne normally have to risk life and limb abseiling over cliff edges to erect nest-boxes for choughs. 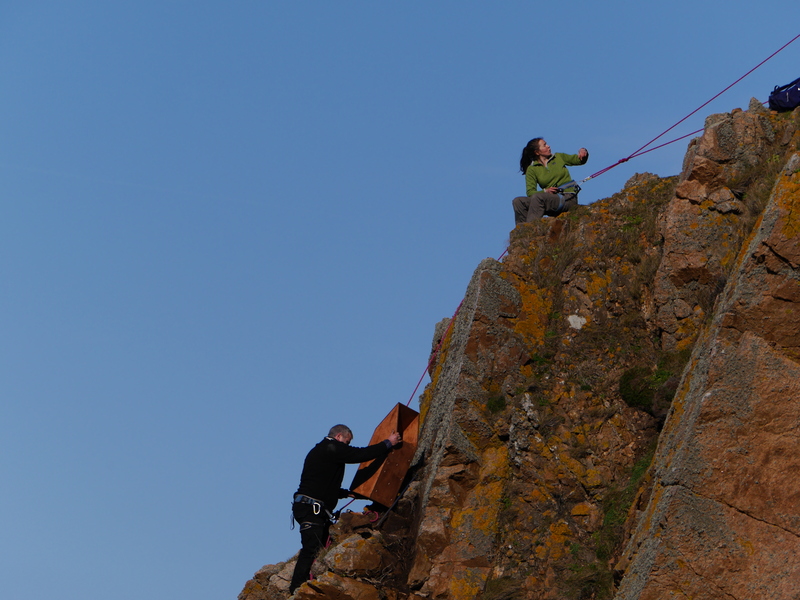 This time Ronez lent a ‘helping hand’…. Kevin assisted in fixing the boxes. 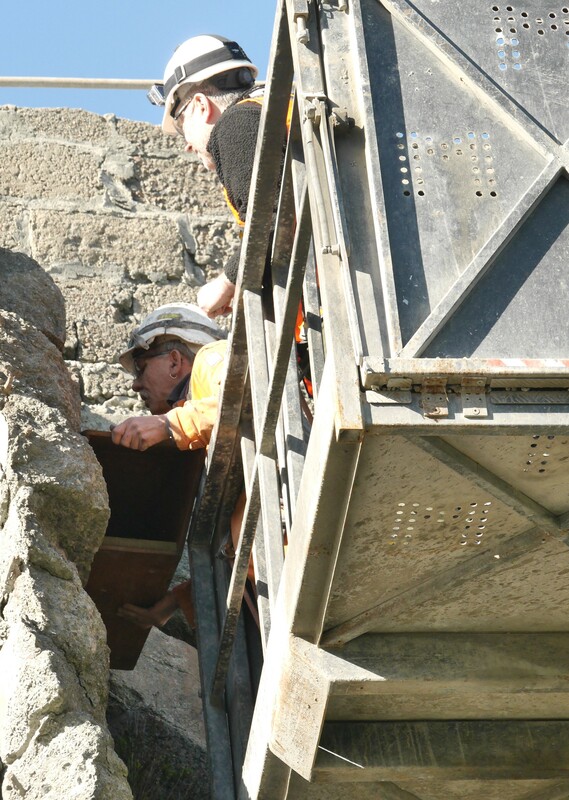 With steel brackets and bolts into the rock I don’t think we will have any problems with boxes falling down! 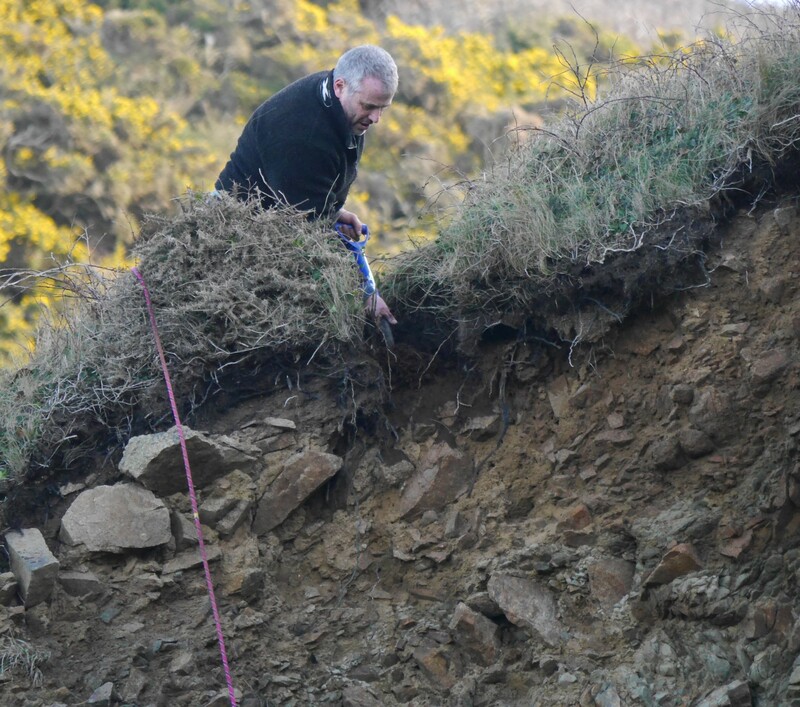 Some boxes just need to be dug into the top of the cliff edge. 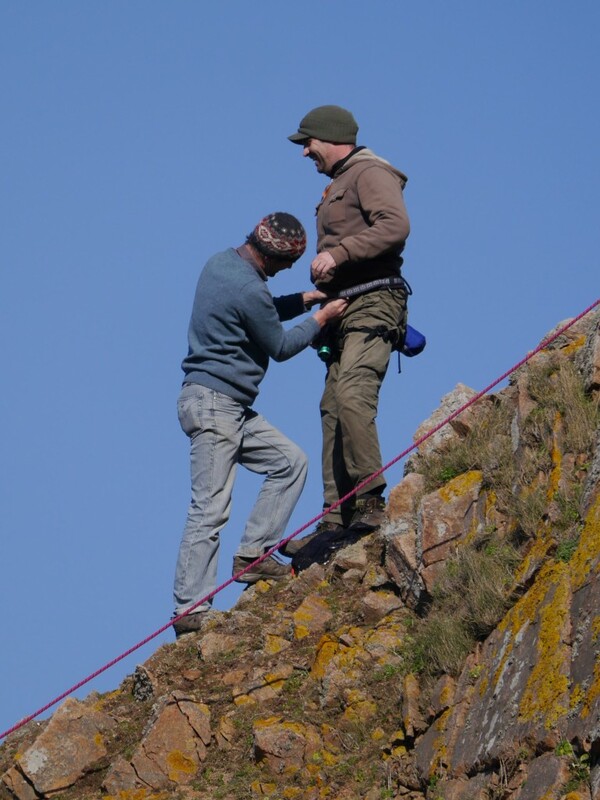 Others can be a bit trickier…. …which is where the extra bodies came in useful. Much to the ‘delight’ of Neil! 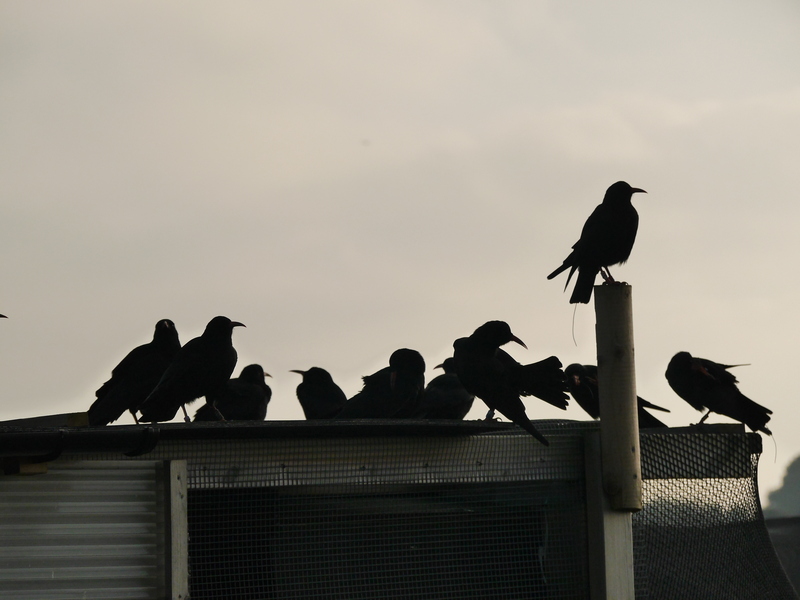 and always of course under the supervision of the choughs. In fact I started to get a bit paranoid by their stalking. Hopefully it meant that by the end of the day they had made a mental note of all the box locations. Preparations for the breeding season have also been underway at the Wildlife Park. Once again we hope to hand-rear and parent chicks from our captive-breeding pairs which can then be used in this year’s soft release. Two breeding pairs have been moved to their off-show aviaries. Gwinny has stayed paired with the same young male as last year. True to the Celtic legend Tristan and Iseult have reunited and, no pressure here, but since they have produced eggs together in the past we have huge expectations for this pair. At the start of February we imported a new male from Paradise Park. Denzel, named by his previous keepers, moved into our quarantine enclosure where he must remain until he has been given the ok from our vets. We are hoping he will pair up with our single female to make a third couple. The nest cameras have been switched on and all the birds have now changed to their breeding diet which means more protein is added to the menu. We will have to wait until March to find out if the pairs decide to build nests. Gianna, meanwhile, is waiting patiently for when they do in case we need to call on her services as a foster mum. We are still at the very early stages of her training. She is starting to allo-preen staff now: a sign of a pair-bonding in the bird world. She might not reach the stage this year in which we are confident with her foster-rearing abilities. However, we would certainly like to think she can aid the breeding programme in the future.